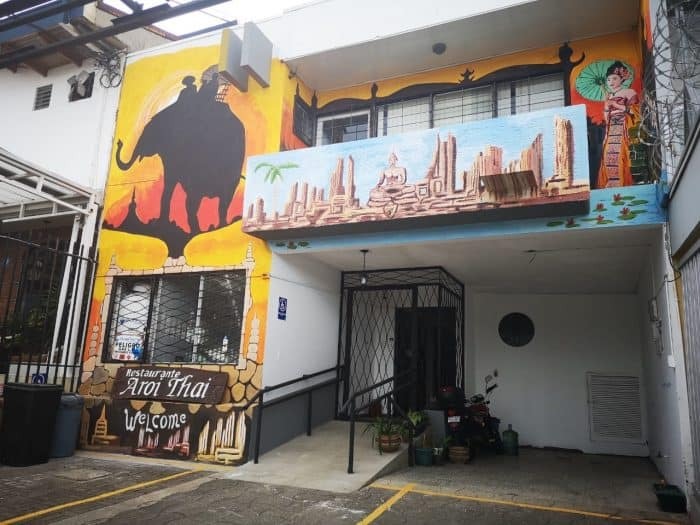 Aroi Thai was the first Thai restaurant in Costa Rica. They started as a delivery-only service before opening a restaurant in Ciudad Colon in 2013. Then they closed about six months ago and recently reemerged in the Mata Redonda district of San José. The chef and owner are still the same though and so is the great food. Aroi Thai is the labor of love of Steffen Hofmann. His inspiration to open the restaurant came after he traveled to Thailand for three months. When he came back to Costa Rica, he had a woman from Thailand fly over and stay with him and teach him the authentic recipes he serves today. It wasn’t easy, he told me, but it was worth it. Chef Hofmann has a four-page menu with what you would expect to find at a Thai restaurant. The greatest hits, if you will. I’d recommend the som tam, the panang curry and the chicken pad thai. They were all absolutely delicious. Som tam, or green papaya salad, is a perfect way to start your meal. It’s fresh and crisp, with a sour and kind of funky dressing based off of fish sauce. For me, it is addicting and I would never get tired of eating it. 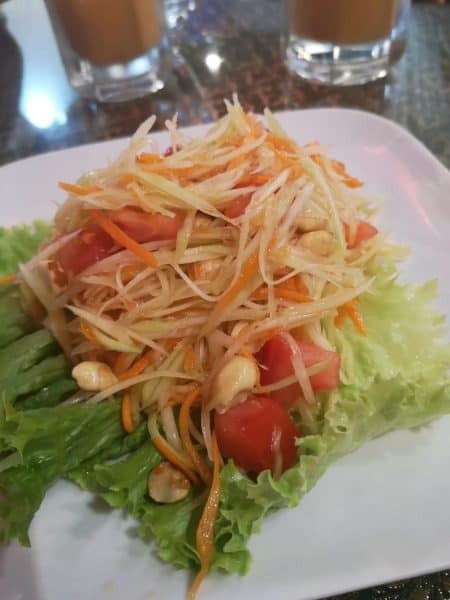 The salad under the dressing is shredded unripe papaya, shredded carrot, tomato and peanuts. It costs 5,000 colones, or about $8.20, and is big enough for two people. 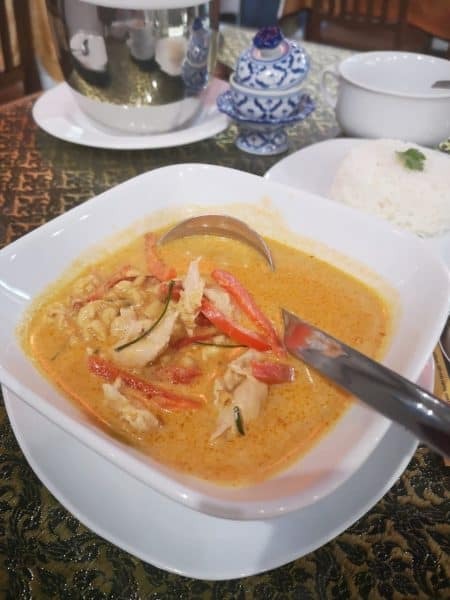 The panang curry is made with red curry paste, sweet pepper, kaffir lime and your choice of chicken, beef or shrimp. It’s served with a small side of jasmine rice. You’re probably not going to want to share this one. I chose chicken and it cost 6,900 colones, or about $11.31. Then, of course, there’s the famous pad thai. You can choose your protein with this one too. Again, I chose chicken. It cost of 7,000 colones, or about $11.48. 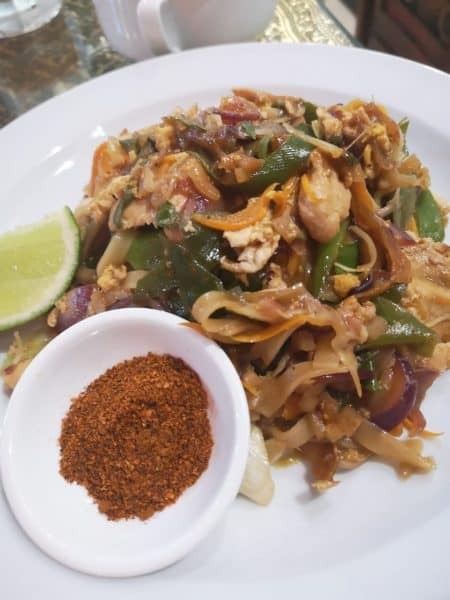 This pad thai is made with a special tamarind sauce that they make in-house. It makes it different than the rest of the pad thais I’ve tried, but in a good way. But like all pad thais, the rice noodles are tossed sauce, mixed with the chicken, some egg, green onions, and roasted peanuts. There is some chili powder and a slice of lime on the side. Use both to top it off and dig in. 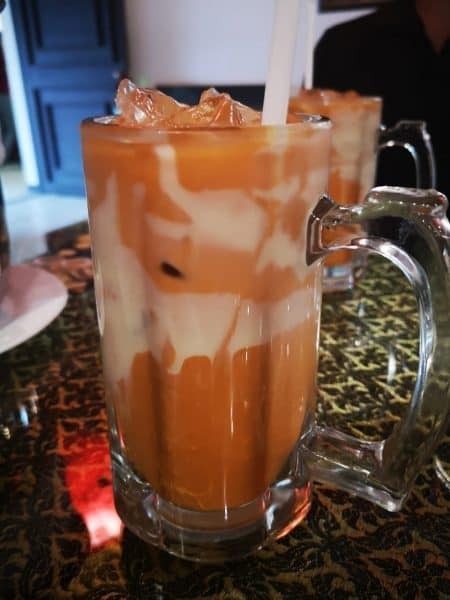 I had a glass of their iced Thai tea with sweetened condensed milk (1,800 colones or $2.95). These go down too easy, so be careful not to fill up before the meal hits the table. Alcohol is limited to an assortment of wines, sangria, and gin and tonics. But this place is all about the food and going out for something new or different. 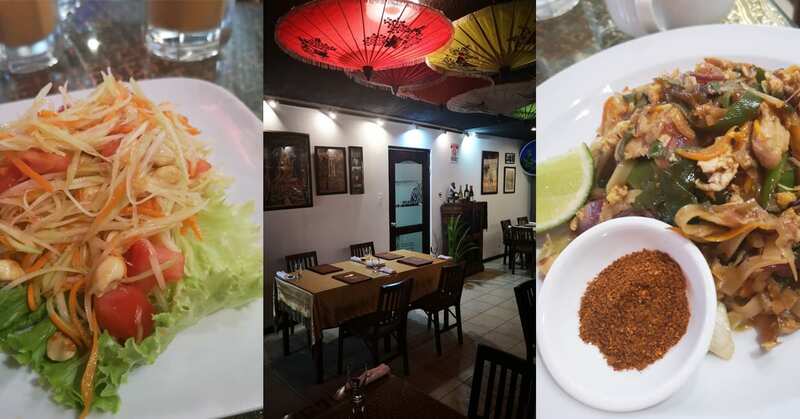 Aroi Thai is a quaint restaurant, on an unsuspecting street on the north side of La Sabana park. There is traditional Thai music playing, and Thai imagery and decorations all around the restaurant. This 37-seat restaurant, which is split up over 11 tables, does accept reservations, but they are not required. If you plan to visit the weekend after this article is published, I’d recommend reserving. Hofmann was born in Colorado and speaks fluent English. He’s lived in Costa Rica for the majority of his life though and considers Costa Rica home. He and I actually graduated from the same high school in Escazú, but we were a few years apart and never met until I started to eat at his restaurant. His fiancé helps him with the service and management side of Aroi Thai, making it a real family business. Aroi Thai is open every day except for Mondays. From Tuesday to Friday, they are open from 11 a.m. to 10 p.m. On Saturday, from 11:30 a.m. to 9:30 p.m. and on Sunday from 11:30 a.m. to 3:00 p.m.
Major credit cards are accepted and menu prices do not include taxes. Vegetarian options are available and so is street parking. Check their Facebook page as they sometimes have promotions like 2×1 sangria. They always offer a menu ejecutivo for those looking to dine on more of a budget; not that this is by any means an expensive restaurant. Search “Aroi Thai” in Waze or Uber to arrive conveniently. And don’t forget: tell them The Tico Times sent you.